Creating new work in collaboration with someone else can be hugely rewarding, it can provide an experimental space in which to explore new mediums, different disciplines and new subject matter. It can loosen us from those means of inspiration, and modes of production and presentation, that have become habitual, lazy even. Collaboration, however, also presents the risk of disappointment and frustration. Pistols & Pollinators is a particularly risky undertaking for participants because, unlike most collaborations of note, participants are invited to work with someone that they do not know, and whose work is unfamiliar to them. Some have approached this challenge as they might a blossoming romance; meeting as soon as possible and as often as possible, sharing meals and walks, taking an active interest in each other and answering each others calls, emails and texts immediately and with enthusiasm. Other pairs have adopted a cooler approach, meeting only once, fleetingly or not at all, and communicating sporadically via text, email or postcards. There is no one ‘correct’ way to collaborate, and the variety of approaches taken by P&P participants mirrors the diverse modes of collaboration to be found throughout art history. 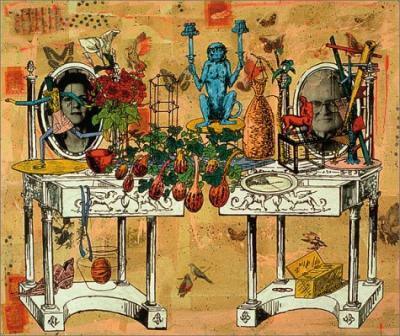 Artists like Gilbert & George and EVA & ADELE (pictured above), for example, operate in a state of permanent collaboration, in complete unison, sharing the workload and the credit for the work produced. Whilst others, like Tracey Emin & Sarah Lucas, have worked collaboratively for brief, but equally committed, periods. 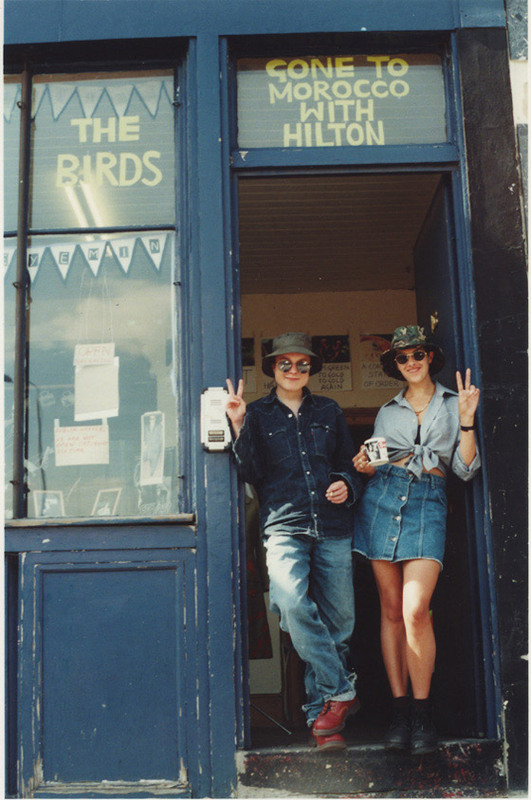 Emin & Lucas ran ‘The Shop’ together for six months, a project that offered an artist-led alternative to commercial galleries. At The Shop visitors could purchase original artworks for bargain prices, join classes and workshops and socialise with exhibiting artists. 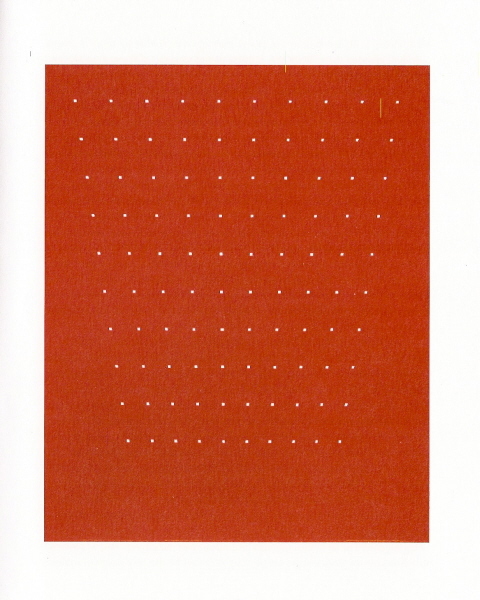 Then there are more tender, shy pairings, like WG Sebald & Tess Jaray, where Jaray produced prints in response to existing poems by Sebald, or John Ashbery & Jane Hammond, where Hammond invited Ashbery to send her a list of titles that she could create paintings in response to. In some instances the term collaboration has been stretched to its limits, and one ‘partner’ could be seen to have been satisfying their own creative endeavors with apparent disregard for the person they were working ‘with’. 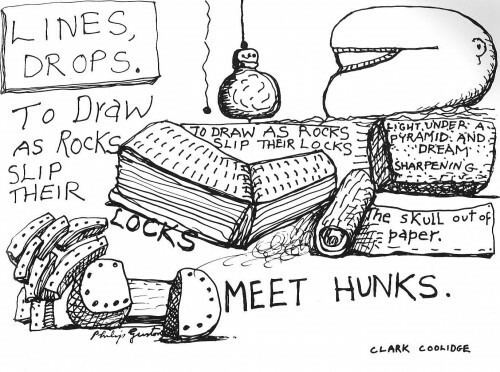 As in Philip Guston’s ‘Poem Paintings’ where he often edited and appropriated poets work without their permission. Given the innumerable ways that any one-on-one relationship might pan out, and the likelihood of differing opinions and desires, it’s a wise move for anyone considering collaborating to first consider what kind of relationship they’d prefer to enter into; all-consuming? casual? playful? provocative? and how they might adapt if they and their partner have differing expectations. Caution should be taken not to fall in love with the idea of collaboration, or to be seduced by any one idea of what the resulting work might be. Trying to determine how a collaboration will run could be seen as a way of establishing how much of a risk one is actually willing to take, for what is at stake here is not a broken heart, but; intellectual property, time, creative control, authorship, credit and of course cash. To collaborate offers an opportunity to experiment and to ‘let go’, but ultimately tests how willing we really are to give up, even temporarily, our own tried and tested practices. Below is a selection of collaborations from recent art history which demonstrates the diversity of approaches to, and outcomes of, collaborative practice. The first section lists artists and poets who have worked together over a limited period of time, the second lists permanent artistic partnerships. Click on the pairs listed for further information.